I had several drive image files, in .tib format, that I had created using Acronis True Image Home 2011 (ATI 2011). These images were backups of Windows 7 system installations on drive C.
As described in another post, I was looking for ways to install and run Windows 7, and various Windows programs, in a virtual machine (VM). Of course, creating a VM from scratch, and then installing and configuring a bunch of Windows programs in it, could take a substantial amount of time. Thus, it seemed that the most convenient method for creating a usable Windows system in a VM might be to simply restore one of those ATI 2011 TIBs into a new VM, or convert the TIB to some format that VM software could use. The question at hand, then, was whether and how I could convert an ATI 2011 TIB into a working VM, probably using VHD format. This post explores that question. I was using VirtualBox, so I focused particularly on converting TIBs into working VirtualBox VMs. In this relatively brief exploration, I found that it was possible to use ATI 2011 to convert a half-dozen TIB drive images of old Windows 7 installations to VHD, and to use those VHDs as the basis for VMs in VirtualBox. The only two VMs that started and ran without obvious Windows-related problems were created from TIBs capturing the state of Windows 7 installations on a Lenovo ThinkPad E430 laptop manufactured in 2012. Possibly those two TIBs were most likely to work because the old laptop’s drivers were widely understood and/or because they were Lenovo-based: I had appreciated IBM’s quality since I bought my first PC, an IBM, in 1983, and I had seen it again in the OS/2 operating system in the 1990s. While those two Lenovo-based VMs seemed to be running Windows successfully, VirtualBox did not allow them (and the other VMs that I was able to run) to run in properly sized windows. It would still have been possible to use them for some purposes, but plainly the little windows were not helpful. It was not clear when or if VirtualBox would be revised so as to eliminate that problem and make those VMs useful. Since those Lenovo-based VMs did run successfully, without driver issues, it was possible that the TIBs from which they were created would also be most likely to succeed if I were to use restoration approach with them. That is, I might have been able to restore those TIBs into a previously created VM, and that might have avoided the problem of small windows. I did not explore that possibility. Finally, the VMs that ran successfully indicated that their copies of Windows 7 needed to be reactivated, and so did the copies of Microsoft Office 2010 installed in those VMs. If phone-based activation worked, this would not necessarily pose a problem to the goal of having VMs that were not connected to the Internet and thus, hopefully, would be insulated from corruption by future Windows updates or other invasive Microsoft activities. This section of this post explores several methods of converting an Acronis TIB to a VHD file that VirtualBox might be able to use. The last of the methods explored in this section did not require ATI to be installed: it would be sufficient to use ATI on a USB or other bootable disk to restore a TIB or other image to the computer, and then use VMware vCenter to virtualize that restored installation. My own needs did not call for further exploration of that method. For my purposes, the TIB conversion options required ATI to be installed. To install ATI on a Windows 7 system, older versions like my ATI 2011 were good enough; for Windows 10 compatibility, ATI 2015 or later would be needed. At this point, I did not explore the question of whether ATI 2011 running in a Win7 VM on Win10 would provide the desired functionality, allowing me to convert TIBs even if I did not have ATI 2015+ or a physical Windows 7 system. With an ATI installation, for my purposes, the viable methods of converting TIB to VHD were (a) create a VHD via Disk Management, and then restore a TIB into it, or (b) use ATI’s conversion tool to convert a TIB to a VHD. As described in the following subsections, both of those methods did produce VHD files from a 28GB TIB input. Win-R (i.e., Run) > diskmgmt.msc (in other words, start Disk Management). Disk Management menu > Action > Create VHD > Location > specify a disk partition big enough to accommodate the contents of the compressed TIB. The VHD had to be created in a location that Acronis could see. For instance, if Acronis running from a bootable USB drive could not access an encrypted partition, then that partition would not be a suitable place to create this VHD. In the same place in Disk Management, specify VHD format. 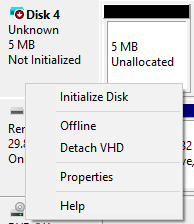 This option was not available in Windows 7: it would produce only VHD, not VHDX, files. But VirtualBox would not use VHDX anyway, so I didn’t mind. For disk type, Fixed might have slightly better performance. But for flexibility, I chose a Dynamic type, twice the size of the compressed TIB. I might have been able to make it smaller, but Acronis rejected my attempts at starting with VHDs smaller or only slightly larger than the TIB. Then click OK to create the empty VHD. Note that its size indicated in Windows Explorer or File Explorer could be much smaller than the size specified or reported in Disk Management, and might also vary if it was detached (below). Run ATI 2011 and restore the TIB into the newly created VHD. I did this by browsing for the desired TIB backup and adding it to my list of backups. Then, for that TIB, I clicked Recover > select the backup of drive C > Choose Recovery Destination > select the Unallocated Space described as Msft Virtual Disk 1.0 > Recover Now. (The Msft Virtual Disk was created by Disk Management in the preceding steps.) That failed with an error message: “Modification has failed: no task to modify” (event code 0x00090063). A search led to a discussion suggesting that the solution was Win-R > services.msc > Acronis Scheduler2 Service > double-click > change Startup Type from Disabled to Automatic > OK. But that didn’t work for me. Acronis said the problem was actually that I was using an older build of ATI 2011. And that was true: Help > About indicated that I was using Build 5519. Their update page led to a link that would allow me to download and install updates to Builds 6868 and 6942. I tried 6942. That worked: recovery now proceeded, at a rate of perhaps 1GB per minute, and produced a 27GB VHD that I could (and did) move to the Windows 10 computer. I didn’t try to do anything with it yet; I wanted to finish exploring the other ways of creating VHDs. When I booted the YUMI drive, I started by trying the option of running ATI 2011 Build 6942. I had just added that option to the YUMI drive. Unfortunately, it seemed this build was not able to recognize a USB mouse. I did have a PS/2 mouse, and the Win10 desktop computer did have a PS/2 jack, so I could have pursued that. But I doubted there would be any significant difference in functionality between two builds of the same Acronis product. Instead, I decided to try the older Build 5519, installed on the YUMI drive previously. That worked. In ATI 2011, I chose Recover My Disks > browse to and select the TIB > Next > select the drive C image > specify recover location. Unfortunately, that was the end of the line. There was no option to select any recovery destination other than the physical hard drive partition presently used as drive C by this system. I stepped back and looked in Tools & Utilities. Here, again, ATI 2011, booted from the USB drive, offered nothing of relevance. I looked briefly at the Acronis WinPE ISO Builder option that was available to me as a Start Menu item on the Windows 7 machine. My impression was that this option was available to me only because I had bought and installed the ATI 2011 Plus Pack. Creating WinPE bootable media could be something of a hassle. Acronis said this media would offer various functions. It did not specify whether it would do TIB to VHD conversions. Bruno penned his note (above) in a thread discussing Acronis 2016. Acronis said that support for Windows 10 began only with ATI 2015. At this writing, new copies of ATI 2016 were available for as low as $14 on eBay, $16 on Amazon. (I didn’t price ATI 2015 or 2017.) If I didn’t care to buy a Win10-compatible version of ATI, it seemed I would be able to use the Disk Management approach only in a Windows 7 (or perhaps XP) system. On the Windows 7 computer, installation of ATI 2011 had created an option to convert an Acronis TIB to a Windows backup in VHD format. This option apparently existed in ATI 2010 as well. Subsequent versions of Acronis, right up to 2017, removed the conversion capability altogether. But then Acronis announced that ATI 2018 ($50 for perpetual use, free trial) was able, once again, to convert an Acronis image to VHD format. But Ghosh said the new ATI 2018 would only do this with full partitions. A search on that led to an Acronis explanation involving Microsoft Hyper-V, not VirtualBox, and a discussion suggesting that the resulting VHD might not be VirtualBox-compatible. My installation of ATI 2011 on the Windows 7 machine produced two ways to start the TIB-to-VHD conversion process: a Start Menu link labeled “Convert Acronis Backup” and a “Convert Acronis Backup to Windows backup” option in Tools & Utilities within the running ATI 2011 program. When I tried the former, I got a “Convert to Windows Backup” dialog; but once I filled out the necessary information and clicked Proceed, nothing happened. The program seemed to die. I rebooted the system and tried again. That worked: I got a Conversion Progress dialog. After maybe 15 minutes, it said, “Conversion has successfully completed,” and I saw that the 28GB TIB had been converted into a 40GB VHD. Alternatively, the convert option running from within ATI 2011 opened the same “Convert to Windows Backup” dialog; I assume its output would have been identical. It was possible to take a snapshot of an ordinary Windows installation, on an actual computer, and use that snapshot to create a VM. To take that snapshot — that is, to virtualize that physical system, MakeUseOf (Yamada, 2017) recommended using Disk2VHD (or CloneVDI). TechGenix (Posey, 2016) offered some tips for making sure that such a process would produce a working VM. There were other possibilities. For instance, VMware’s vCenter Converter, another free option, would produce VMDK files. Normally, those would be intended for use in VMware Workstation, but it appeared that VirtualBox could use VMDKs. In my experience, as described in the previous post, VMware’s free vCenter Converter Standalone version 6.0 had successfully converted a simple Windows XP physical installation to VMDK format. At present, I did not need this approach. My current Windows 7 installation was old and had some problems; I did not want to use it as a VM. I could have restored a Windows 7 TIB to that machine, and then virtualized that installation, except that the Win7 TIBs I was most interested in were not created on that machine. It was possible to create an image on one computer and restore it to a different computer. The general impression seemed to be that doing so would require the “universal restore” or “dissimilar hardware” capabilities offered in present and/or previous versions of ATI, AOMEI, Macrium Reflect, EaseUS Todo Backup, and possibly some other drive image programs. I had little experience in restoring to dissimilar hardware, and most of my experience had not been successful, even though I had purchased and had tried to use the ATI 2011 Plus Pack that was supposedly designed for that purpose. A search led to no recent indications that it would be possible to use anything other than ATI to convert a TIB to a VM. VMware’s vCenter Converter previously offered this capability, but I didn’t see it there anymore, and an Acronis discusion confirmed that VMware no longer supported conversion of third-party (e.g., Acronis) drive images. Wikipedia said that support ended circa 2013, and mentioned no alternatives. As described in the preceding section, I was able to use two different methods to convert an ATI TIB to a VM in VHD format. Now it was time to see whether those two VMs worked. I started by downloading Oracle’s VirtualBox 5.2.6 (VirtualBox-5.2.6-120293-Win.exe), along with its Guest Additions and Extension Pack. The first step was to install it. When I double-clicked on VirtualBox-5.2.6-120293-Win.exe in the Windows 10 File Explorer, I got a message: “Windows protected your PC.” Apparently that was fairly unusual. I got past it by clicking “More info”: that brought up the “Run anyway” option. The VirtualBox User Manual (§1.5) said that I could proceed to install the Extension Pack (Oracle_VM_VirtualBox_Extension_Pack-5.2.6.vbox-extpack), also by double-clicking. I tried that, but got an error: “Failed to open the Extension Pack.” The Details for that error said, “RTVfsFsStrmNext failed: VERR_TAR_BAD_CHKSUM_FIELD.” It seemed I might have downloaded a bad copy. I re-downloaded. This time, I got a slightly different file: Oracle_VM_VirtualBox_Extension_Pack-5.2.6-120293.vbox-extpack. This one ran OK. I think the bad one came from Softpedia, and the good one came from VirtualBox itself. Oracle’s instructions said the Guest Additions would be installed after I had an operating system (OS) in place, so I did nothing further with that for now. The User Manual (§5.2) said that VirtualBox would normally use its own Virtual Disk Image (VDI) format — that this would be the format created when I created a new VM. But the Manual said VirtualBox also supported VMDK and VHD, along with the Parallels HDD format used on Apple machines. The manual recommended using dynamically allocated images, as they offered greater flexibility and their performance penalty would eventually be negligible. Elsewhere, the Manual (§1.14) indicated that VMs in OVF or OVA format could be imported and exported. I wasn’t sure what that meant to me. At this point, I proceeded to create VMs, as described below. I would soon learn that this step was a bit premature. I should have gone, first, into VirtualBox > File Preferences > General tab > change Default Machine Folder to the desired drive or partition, so that VMs would be saved on a partition that had room for them. Instead, I had to fool with them later (below). Changing the Default Machine Folder would take care of the later option to modify Settings > General > Advanced tab > Snapshot Folder. So now I created VMs. That started with a search, which led to a Datto article (Woellhof, 2017) which, with my own recollection from previous VirtualBox usage, advised me, in effect, to go into VirtualBox > New > Expert (not Guided) Mode. I created one VM for each of my newly created VHDs. I named the VM for the first one “Disk Management” and the second one “ATI Conversion,” to remind me of how I had created them. For both, the type was Microsoft Windows 7 (64-bit), because that’s what the original installation (backed up in the TIB) had been. The selection box was sneaky: if I changed other things in this dialog, sometimes it would eliminate the name or change the VM type. For each VM, on a host machine with 24GB RAM, I allocated 2048MB RAM and chose “Use an existing virtual hard drive file.” I clicked the folder icon, navigated to the correct VHD, and then clicked Create. I did not intend to use either of these machines at this point, so I did not revise their Settings in VirtualBox. Later, I would decide that that, too, was a mistake: for each VM, I should have gone into Settings > Network > Adapter 1 > check Enable Network Adapter > set it to Not Attached > uncheck Enable Network Adapter (and likewise for Adapter 2 et seq.). I made that change because I did not yet want these VMs to connect with the Internet. They were old; I had no idea what updates (e.g., Windows, antivirus, other programs) should be installed, or might install themselves, or whether any of those updates (especially but not only from Microsoft) would alter the VM in ways that would make it less functional or more problematic. Once the VMs were created, to improve performance, on a system with spare resources, I also changed Settings > System > Processor tab > 2 CPUs (out of eight available) and Settings > Display > Screen > Video Memory > 128MB. In addition, I increased the RAM allocation to 8192MB. I selected the first VM, clicked Start, and watched; and then I closed that one and tried the other. The first one, Disk Management, just gave me a blinking white cursor on a black screen (along with one or two VirtualBox notices about keyboard and/or mouse). A search led to various suggestions, but most seemed to pertain to VMs that had previously worked. I suspected that a failure to run at all meant that I had a dud. I was especially inclined to suspect that in light of the VHD’s size. As noted above, it was 27GB, which actually made it a bit smaller than the TIB from which it was created. I tended to use the next-to-highest compression setting in ATI 2011. I doubted such a highly compressed file would support a working VM. After all, in my previous exploration, a 61GB Windows 7 TIB resulted in a 118GB VHD. I concluded that, if it became necessary to make the Disk Management procedure succeed, I would start by redoing the VHD creation procedure, to see if I got a different result. So I turned to the ATI Conversion VM. This was a different matter. Within a few seconds, the blinking cursor turned into a “Starting Windows” screen. It appeared that I had a winner. Then it looked like it had died — I was left with a black screen. But patience shall be rewarded: after a minute or so, it gave me a Windows 7 sign-in screen. I signed in and got “Welcome,” and it proceeded on into a regular Windows 7 desktop that, after five or ten minutes’ tinkering, still seemed to be functioning normally. It appeared that we were in business. Granted, this VM was very slow in starting up. But I believed the slowness could be substantially rectified — among other things, I believed the VirtualBox Guest Additions could work miracles, and it wouldn’t hurt to put the VM on a solid state drive (SSD). The conclusion here was just that the ATI Conversion approach — the one described, above, in the subsection titled “Creating a VHD via ATI 2011 Conversion Option” –– did produce a working VM from a TIB. While I was pleased, I was not yet convinced that I had arrived at a good method for converting TIBs to VirtualBox VMs. It was one thing for the ATI 2011 conversion process to succeed with a nearly virginal 28GB TIB. Now it was time to try it it with some larger TIBs, capturing more complex Windows 7 installations. I returned to ATI 2011 and used its conversion option on TIB images of mature Win7 systems from several different computers. This included the 61GB TIB (producing a 120GB VHD) that I had attempted in the previous post — the difference being that, this time, I was using ATI 2011 Build 6942 (above). I hoped that this (or other unknown factors) would produce success. Hope turned to joy as the 118GB monster VHD produced from that 61GB TIB did, in fact, boot within VirtualBox. It took several lifetimes to finish booting; we were indeed hoping for miracles from those speedup techniques. (To proceed on into the VM, once I got to the Windows 7 screen asking me to press Ctrl-Alt-Delete, I had to hit Host-Del. By default, Host was Right-Ctrl.) But in any event — especially after a retry, allowing me to increase the RAM allocated to the VM — it worked. I was about to find that the same was true for VMs created from other old TIBs. This, however, was the point at which I realized I should have been creating these VMs on a different partition. To fix that, I ran a search and started to use advice by TechRepublic (Wallen, 2016), so as to move them. Then I decided it would be easier to delete them. For that, the search led to Geek University advice to use right-click > Remove > Delete all files. As promised, that deleted even the VHD, which would ordinarily not be desired. But I vaguely recalled bad experiences, previously, in terms of incomplete or otherwise screwed-up moves or deletions of VirtualBox VMs. I didn’t want to go there. So I went ahead and removed everything, and then restored the VHDs from backup and started over. They were large, so that took a while. Now I had new VMs, not connected to the Internet, located on the desired partition. For the moment, this partition was on a hard drive, not an SSD. I noticed that, for each VM, the relevant files included the VHD, which was large (ranging from roughly 30 to 120 GB, for these VMs), along with little (3KB) .vbox and .vbox-prev files. The manual explained that .vbox files contained the VM’s settings, in XML format. The .vbox-prev files appeared to be backups. I took a preliminary look at each VM, one at a time, by selecting the VM and clicking Start. Each VM started successfully albeit slowly. For each VM, almost immediately after I entered my password at the Windows 7 login screen, I got a message: “You must restart your computer to apply these changes.” A search did not provide enlightenment. I suspected Windows was recognizing that it was no longer running on the machine where the TIB had been created, and was adjusting itself accordingly. The VMs that were at least somewhat functional wanted me to go online to install or update antivirus, install Windows updates, reactivate Windows, and so forth. But I was interested in running a Windows 7 installation that was not in touch with the Internet precisely because, as described in the other post, over the past several years, I and others had observed that system problems seemed to increase when Microsoft felt it was time for us to spend more money or give Microsoft more control over our systems. I wanted to keep the VM offline. If there was no way to do that, then I would want to know that. Some VMs immediately displayed problems that surely did not exist in the original system imaged by the TIB (because I wouldn’t have made an image backup of a troubled system). For example, the big 61GB TIB did not seem to want to run any of its installed software properly. Even an attempt to run a session of Windows Explorer resulted in a “Server execution failed” error. The Start menu did not seem to be functioning properly either. For instance, to run Excel in that VM, I had to use Start > Run > CMD, and then enter commands to navigate manually to where Excel.exe was located, and then type “Excel” on the command line. That got Excel to run; but then Microsoft Office immediately said that it, too, needed to be activated; and when I used the option to use it without activation for the time being, Excel would not accept keyboard input. Overall, that big VM was still very, very slow, even with Guest Additions installed. I decided that it would probably make more sense to start with a lean, clean VM, if at all possible, and add software to it as needed, rather than try to make that big, ugly thing work well. Two well-developed VMs would not start at all. They would very rapidly flash a blue screen of death (BSOD) with STOP code 0x0000007B. (I was able to capture that information only by making the mouse active outside of the VM and then using PrintScreen when the BSOD appeared for only about one second.) Lifewire said that device driver issues would be one possible explanation for that error. Driver issues would be no surprise; after all, this was entirely different hardware, requiring entirely different drivers. It may have been possible to troubleshoot and resolve that issue. I was not presently inclined to do that; as just noted, I was more inclined to spend that time building a fresh, new VM. I didn’t have the VirtualBox blue cube icon in the system tray (i.e., in the bottom right corner of the Windows installation running inside the VM). I didn’t see anything resembling Oracle VirtualBox Guest Additions in the Windows 7 Control Panel > Programs and Features list of installed programs. The VirtualBox menu > View > Auto-resize Guest Display option was still grayed out, preventing the VM window from resizing itself appropriately. A Linux source suggested going into VirtualBox menu > File > Preferences > Display > Maximum Guest Screen Size = Hint, Width and Height = 1920 and 1080 > Restart the VM. That didn’t seem to fix the problem: the system tray icon was still not there, Programs and Features still didn’t list the Guest Additions. With the VM powered off, go into Settings > Display > Screen > enable 2D & 3D acceleration. With the VM running, enable Guest Additions in the Startup tab of Windows Task Manager. Unfortunately, no such tab existed in Task Manager in Windows 7). It tentatively appeared that this problem with Guest Additions and/or the inability to resize might arise specifically from these TIB-to-VHD VMs: I didn’t recall any such problem in my most recent uses of VirtualBox with VMs created in other ways. The inability to resize rendered these VMs rather useless, at least until a solution appeared. Before setting them aside, however, I did want to verify their activation status. Control Panel > System confirmed that all of them needed to be reactivated. This entry was posted in Uncategorized and tagged Acronis, ATI, ATIH, Auto-resize Guest Display, conversion, convert, converting, grayed, greyed, Guest Additions, image, restore, TIB, True Image, VHD, virtual machine, VM, Windows. Bookmark the permalink. Thank you for this, I had forgotten or never knew about the dscmgmt vhd. I needed to make acronis tib files available in virtual box so i could restore a system since shared files do not show up in the 2011 version of acronis boot disc. having a mounted drive to restore from will be perfect.